Being on your feet all day can be a real pain in the foot. And the back. And the neck. Over time, many nurses also find that the start of varicose veins makes the completion of their work more difficult. To counter the discomfort, pain, and exhaustion, many nurses (both men and women) are turning to compression socks to help get through their day. Do compression socks really work? What potential benefits can nurses receive when they start wearing compression socks? This guide will help you find a high quality pair to try for yourself so you can see how much of a difference they might make for your day. Compression socks come in a variety of styles. They have different compression ratings. You can even choose knee-high, calf-high, or ankle-high compression socks based on your preference or dress code requirements. The chart below will let you quickly compare the top-rated items in this category so you can have your needs met right now. How Are Compression Socks Made? Compression socks won’t make you a better nurse, just like compression clothing won’t make you a better athlete. These snug apparel items do make you more comfortable, however, and that can help you keep your mind on the job that needs to get done. Studies have found that compression products work well in two specific situations: when you are performing explosive exercises and when you need to be on your feet all day. Maybe you’re familiar with the old Spandex apparel options – modern compression socks are an evolution of this technology. They are form-fitting socks that may improve blood circulation, prevent lactic acid build-up, and a number of additional benefits that can help you feel better when it’s time to come home at the end of the day. What Are the Benefits of Wearing Compression Socks? Let’s face it: most compression socks are knee-length and those have never really been fashionably acceptable. You’ll see them on athletes at times and maybe out on a hiking trail, but wear them to the store and you’ll discover that you can scare people into a 20 foot perimeter around you. 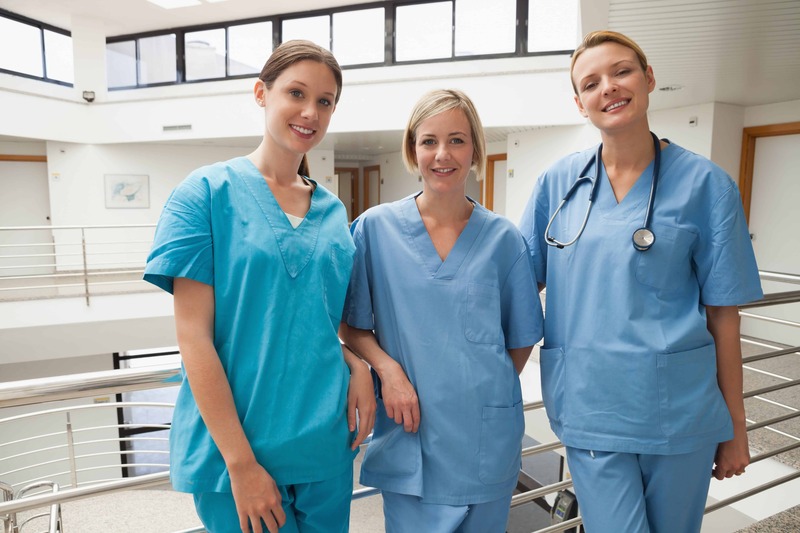 Even with the best scrub pants being worn, nurses have been hesitant to adopt compression socks for a variety of fashion and practical reasons. Some might even argue that the benefits of wearing compression socks are experienced more in the head than in the foot. Whether that is true or not, making the investment into a good pair of compression socks for nurses can bring about 5 specific benefits. It’s an added level of protection. Many contaminants you’ll encounter during a shift typically spill downward. Compression socks will give you an extra layer of protection from the knee down. It limits swelling. Compression technologies are proven to limit swelling, especially when there is a requirement to be on your feet for a long time every day. It limits abrasions to your feet and legs. If you rub up against something accidentally, like a bed tray or a corner cabinet, compression socks can prevent those little nagging scratches and injuries that occur. It adds warmth. Many medical facilities feel a little cold. These socks can help to make you feel warmer throughout your entire shift, adding to your overall comfort level. It looks cool. Many compression socks today are offered in fun patterns, making them cool to wear even if knee-highs aren’t always considered to be socially acceptable. One word of advice: you may find that white compression socks are available. These may not always be the best choice depending on what your nursing responsibilities happen to be. White socks tend to turn yellow over time with sweat and they’ll pick up noticeable stains that will turn you off from wearing them. White compression socks are better than no compression socks, however, so keep all of your options open. Compression socks are like other compression gear that is available today. Each is offered with a certain compression rating so that you know just how tight those stockings are going to be. In the past, these ratings were only important to diabetics and airline pilots, but the times are certainly changing. Most compression socks are rated from 8mmHG of compression to 40 mmHg. Anything above 15mmHG is considered to be a moderate level of compression. 20+ mmHg is considered to be firm and then 30+ mmHg is called “extra firm.” Each level of compression offers certain benefits that can be experienced. This buyer’s guide for compression stockings can take you through each benefit to let you know what type of stocking will work for you. Then it’s just a matter of finding the right size of compression socks for you. Most of these stockings are designed around the US shoe sizing system. If ordering socks outside the US, you’ll need to perform a shoe size conversion to make sure you receive the correct size. What Are the Prices of Compression Socks for Nurses? Compression socks are going to cost more than your average pair of socks, but nurses won’t usually need to pay as much as an athlete would for this clothing need. Most compression socks for nurses are priced in the $10-$15 per pair range, compared with $30-$40 per pair for runners and all day hikers. Premium socks in this category for nurses typically fit in the $20-$30 range. Calf-length or ankle-length compression socks are usually about 10-20% cheaper than knee-highs, but may not provide the same level of daily benefits. We loved these compression socks for three specific reasons. First is the compression rating, which is 12-14, so you don’t feel like there are clamps on your calves when wearing them all day. Then there is the pink ribbon design, which allows you to support breast cancer awareness as you go about your duties during the day. Then there’s the heel and toe pocket on these socks which is surprisingly roomy, giving you added comfort where seams sometimes cause pressure points. And how can we ignore the price? Made from nylon with just a touch of Spandex, we loved these socks and so will you. Click here to view the price on Amazon and find a great deal. If you are really active during a shift, then a higher level of compression may be needed to keep your feet from feeling fatigued and painful. With a rating of up to 30, these socks help to improve blood circulation as you move so you can keep moving instead of needing to stop. Made from a blended nylon fabric, these work for both men and women. Silver infusions help to fight odor, moisture, and even bacteria. If you need premium results, then you’re going to want these compression socks. Instead of having an overall compression experience like some socks provide, this pair will give you a graduated experience. The highest levels of compression happen at the ankle, rated at 30, and then it gradually decreases as it moves up the leg. There are several fun colors and styles so you can show off your personality and we really love the anti-static design so you can wash and wear them repeatedly. If you struggle with muscle fatigue, especially in the feet or calves, then give these unisex socks a try today. If you’ve worn compression socks for some time, you may have noticed how some tend to make your muscles “wobble” as you walk or run. That vibration can be just as tiring as if you weren’t wearing any compression materials at all. This is why we love these particular socks. They sit a little lower than some other brands, but they also have shin and arch supports that can even comfort chafing, skin irritation, or blisters. Wear a pair of these compression socks once and you won’t believe how good you’ll feel after a long shift. If all you want is a minimal level of compression, but a whole lot of fun fashion, then we highly recommend these knee-high socks. Fun medical images, from stethoscopes to bandages, cover the socks that are made from cotton/poly/Spandex blend. This makes them super soft to wear, even if one size is designed to fit most. Larger feet are accommodated better than smaller feet in our experience, so if you have a shoe size of 5 or smaller, you might want to try these socks out and then take advantage of the return policy if needed. Compression socks are nice during the warmer months, but they don’t always keep the cold out when Christmas rolls around. These socks are very different. Made from a wool/nylon/rayon combination with a touch of Spandex, you get a max 20 compression rating and a lot of extra warmth. The compression is also graduated, so you would feel like the socks are trying to strangle your calves. Choose from a variety of fun colors and designs and you’ll have a reliable pair of socks to enjoy for every shift you need to work. These calf-high socks help to reduce muscle soreness after a long shift, which also helps to improve your recovery time after a day on your feet. Designed for runners, we appreciated how the materials of the sock help to keep moisture wicked away from your feet, making them perfect for nurses, doctors, CNAs, and other caregivers. The graduated compression helps to alleviate some stress, even at night, and each pair is made from Spandex and nylon. If you don’t like the idea of super tall socks, this is an alternative we highly recommend. When it comes to compression socks, we’d generally stay away from any that are white. Yet these socks, which are twelve inches long, also provide the most compression we experienced out of any brand. Created by a manufacturer that produces some of the top medical equipment in the industry, it’s a 65/35 nylon/Spandex mix. Just take care if you’re nursing shoes are already feeling a bit tight – these socks are a little thicker than expected, so keep that in mind as you order. Many compression socks are designed to work under loose fitting clothes, like a set of high quality scrubs. Try to wear them underneath jeans or trousers and you might have a different story. The materials can rub on each other, creating premature wear patterns and added heat from the friction. These socks we found provided a superior fit as claimed while still providing a mild-to-moderate compression level of 14. They look great, feel better, and have a competitive price which makes them worth a second look. These calf-high socks are a nice alternative to those who prefer lower socks. Made from a wool combination, you’ll still receive a compression of up to 20 mmHg at the ankle to promote circulation. The Spandex in the sock helps to keep it in place all day long, staying where you put it first thing in the morning – or evening if you’re working a night shift. Arch supports are built-in, but the real advantage comes from the turn welt top that doesn’t roll up or constrict your muscle. Give these socks a try on your next shift and we’re confident that you’ll enjoy the results. The best compression socks for nurses will help you manage lower body pain and fatigue with great effectiveness. Although some of these socks may run up to $40 per pair, they will provide benefits all day long for you and be able to repeat those results on a regular basis. Find your preferred pair, order today, and stop putting up with low energy levels when you get home. These compression socks will change everything. MCAT Scores: What Is Good? What Is Average? What Is the Range? Medical Programs: What Are Your Chances? How Can You Improve Them? Ward Heroes is a participant in the Amazon Services LLC Associates Program, an affiliate advertising program designed to provide a means for sites to earn advertising fees by advertising and linking to Amazon.com. Amazon and the Amazon logo are trademarks of Amazon.com, Inc. or its affiliates.